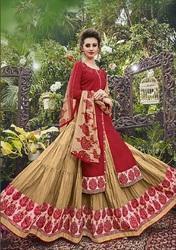 Prominent & Leading Manufacturer and Exporter from Surat, we offer Partywear Salwar Kameez such as Georgette Party Wear Salwar Suit, Embroidered Salwar Kameez, Fancy Anarkali Board Embroidery Border Salwar Kameez, Designer Long Dresses, Embroidery Ceremonial Suit, Colour Party Wear Salwar Suit and many more items. "Establish a smashing influence wherever you go with this pink color festive wear embroidered salwar kameez. This semi-stitched designer salwar kameez is decorated with stunning embroidery work that gives a vibrant look to the attire. The outfit consists of georgette brasso kameez, shantoon bottom, shantoon inner and chiffon dupatta." Be the center of attraction just like the actor Karishma Kapoor with this fabulous Peach color long length designer dress material. This un-stitched salwar suit is gracefully embellished with fancy patch work, resham, lace work that makes it a must have outfit for all parties and functions. 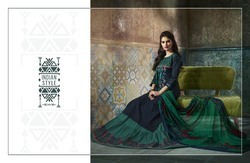 The outfit consists of cotton top, cotton bottom and chiffon dupatta. Leave a long lasting impression on your onlookers by adding this stunning black color embroidered designer salwar kameez to your wardrobe collection. This designer semi-stitched dress material is festooned with excellent embroidery work and border work that gives a mesmerizing look to the attire. The outfit consists of georgette and brasso kameez, shantoon bottom, shantoon inner and chiffon dupatta.